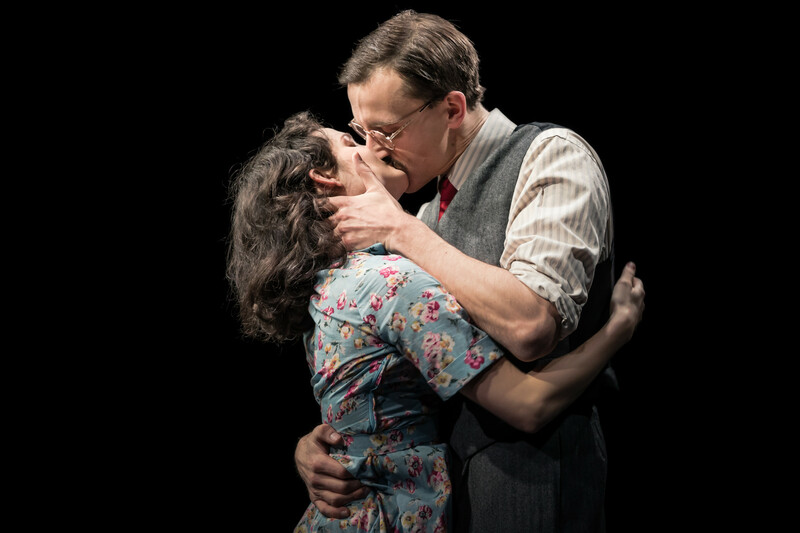 Public and private lives intertwine in James Phillips’s The Rubenstein Kiss, first seen at Hampstead Theatre in 2005. 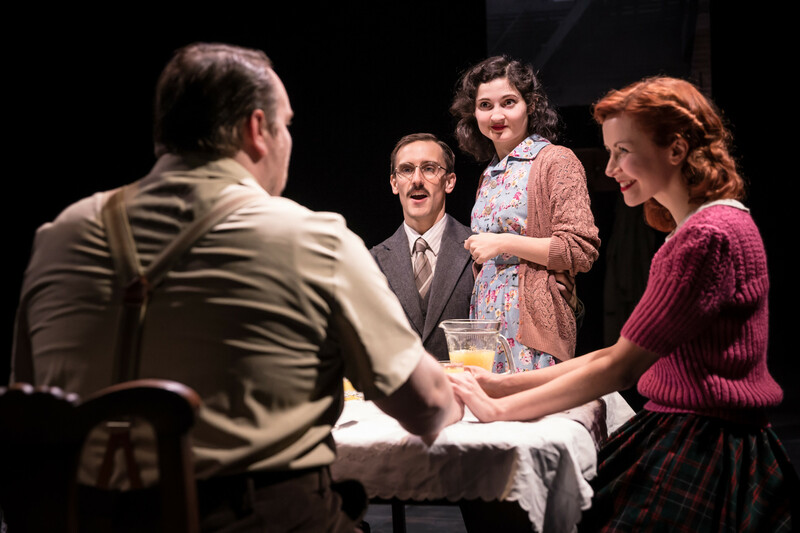 Phillips was apparently inspired to write the award-winning The Rubenstein Kiss (it won both the John Whiting and TMA Best play awards that year) after seeing a newspaper cutting of the kiss between Ethel and Julius Rosenberg before they went to the electric chair. The Rosenbergs, lest we forget, were the last people in the USA to be executed for spying, allegedly for passing atomic secrets to the Russians. This was in the early 1950s when the Cold War was at its height, and when the atmosphere had briskly turned from seeing Russia as an ally in defeating Hitler to one of `reds under the beds and febrile anti-communist witch-hunts led by Senator Joe McCarthy. Revived now by the highly respected director, Joe Harmston, as a timely reminder of the cost of political principles, it sits uneasily in our own time of desperate political uncertainty and turbulence with scares once again rife about Russian western interference. Phillips however doesn’t dwell so much on political niceties as the domestic and personal fall-out of the Rosenbergs’ (here dubbed Rubenstein) dedication to the communist cause and to the dream of a better, more equal world. (Compare and contrast, if you will, our own nest of spies around that time, the Oxford Burgess/Blunt spy ring and the Portland spy ring). © Scott Rylander, Jakob (Henry Proffit), finally confronted with revealing atomic secrets to the Russians by FBI agent, Paul Cranmer (Stephen Billington). As a moral tale as well as a fictionalised historical account, The Rubenstein Kiss owes much to Arthur Miller’s The Crucible. There is even a nod towards Miller’s John Proctor’s final `conversion’ to a self-imposed moral code in Jakob/Julius’s refusal to `confess’ to the FBI agent, Paul Cranmer, desperate to get him to agree to a plea pardon and live. Switching between the 1950s and the 1980s allows Phillips to develop the contrast between the idealism of the parents with the legacy it has bequeathed to the Rubenstein’s son, Matthew and Anna with whom he has just developed a relationship who is the daughter of the brother-in-law who betrayed his parents. In a perhaps too neat chance meeting, Matthew has met Anna in a gallery gazing at the same photo of `the kiss’. Harmston’s traverse production conjures up both time scales with admirable economy thanks to lighting designer, Mike Robertson’s subtle lighting shifts and designer Sean Cavanagh’s painted backdrops of New York apartment outlines at either side of the stage. The onus, of course, is on the protagonists and once again, Henry Proffit, who lead the Devil You Know Company in a bleakly apocalyptic version of Macbeth at Peckham’s Bussey Building two years ago provides us with another impassioned portrait. Sean Rigby (more immediately recognisable as Shaun Evans’ sidekick in the tv Morse prequel crime series, Endeavour) makes a convincingly pliable brother-in-law, David, whilst Eva-Jane Willis as Rachel, his wife, and Ruby Bentall (who bears an uncanny likeness to Ethel Rosenberg) provide thoughtful portrayals of loving wives caught in an historical moment. © Scott Rylander, Dario Coates as Matthew Rubenstein beginning to trace the legacy of his parents with Anna (Katie Eldred), with whom he’s just started a relationship and who is the daughter of the man (and brother-in-law) who `betrayed’ his parents. 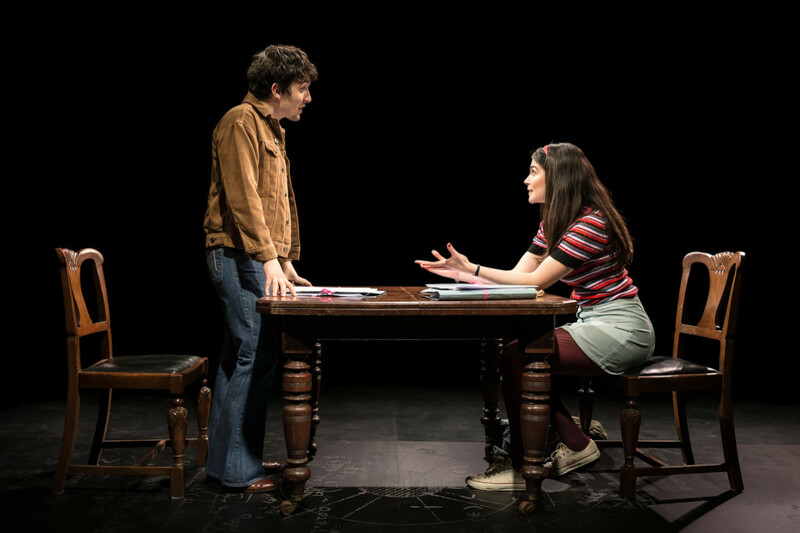 Katie Eldred and Dario Coates play the two young lovers, bombarded by the past, trying to discover the truth of their inheritance with admirable fervour and perplexity. 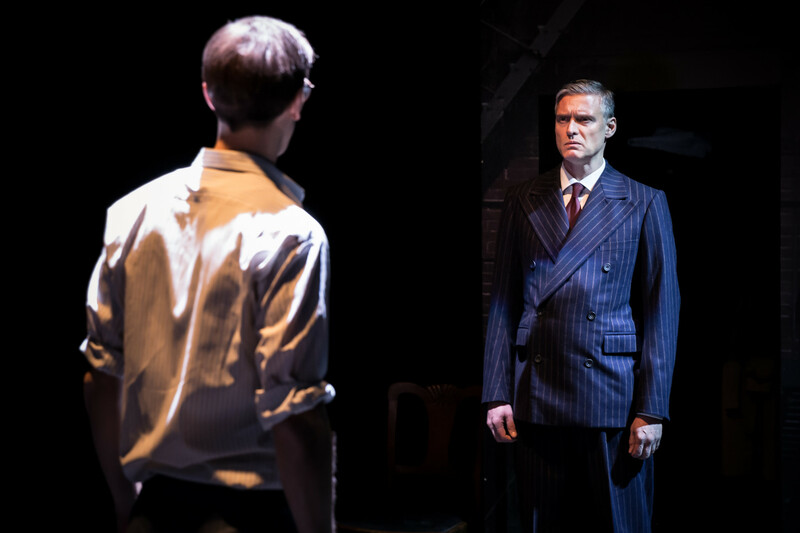 All in all, Harmston’s production brings Phillips’s extraordinary empathy with his subject to a tender and sensitive conclusion whilst weighing up the noble aspirations of idealism with its harsh legacies for those who inherit them. First perf of this production of The Rubenstein Kiss at Southwark Playhouse, Mar 14, 2019. Runs to April 13, 2019. The Rubenstein Kiss was first staged at Hampstead Theatre, London, Nov 2005.